If you have Midland Credit Management (also known as Midland Funding) on your credit report, it’s killing your credit score. You know this, but what you may not know is that Midland is notorious for using improper practices that violate protections set aside by the FDCPA. Find out some of the shady practices they’re doing that they shouldn’t be, and then read a real-life example of how to get Midland off your back and the negative marks legally and permanently removed from your credit reports. 2 How does Midland Credit Management try to collect debts? 3 What are my legal rights during debt collection? When you have a negative entry listed on your credit report from Midland, there are a few different ways you can deal with it. Try these four tips for removal in order to help kickstart your credit repair process. Midland is known for its quasi-unethical debt collection practices, which can include breaking promises made over the phone. They do this because it’s difficult for you to prove what was said during your conversation. To avoid this, tell Midland that you only want to communicate via written communication. You have the right to do this under the Fair Credit Reporting Act, and you’ll want to send your request in writing as quickly as possible. They should start sending everything in the mail, otherwise, you can report them for unfair debt collection practices. Next, send a debt validation letter. This is a formal request that can be made within 30 days of first hearing from Midland. It’s their responsibility to prove that the debt is yours and that all of the account details are accurate. Because Midland buys debt from other companies, it’s quite possible that their records are inaccurate or incomplete. If they do send you some proof of the debt, make sure all the details are accurate. For example, if any dates are wrong or previous payments aren’t listed, then you can ask them to remove the incorrect entry from your credit report. If Midland does happen to validate your debt, you have the option to settle the amount you owe. This means you can pay less than what you owe in exchange for having the debt settled and removed from your credit report. It’s very important that you get the deal in writing, though; otherwise, you risk Midland going back on their word. Once you have a written agreement on how you want the settlement handled, you can make your payment. Negotiating with Midland and the credit bureaus can be a tricky, time-consuming process. Avoid the headaches and potentially missing key details in an agreement by outsourcing the work to a professional credit repair firm. They have the expertise of debt collection law to know exactly what Midland can and can’t do. They also know how to navigate the system to maximize your personal benefits and get those negative items removed. Plus, it can save you a ton of time and often yield better results than if you went at it alone. Want to Remove Midland Credit Management from Your Credit Report? How does Midland Credit Management try to collect debts? Midland has been known to have the wrong address or the incorrect apartment number on file (it’s true, and it’s horrible when it happens). Imagine your neighbor getting his hands on a collection letter intended for you. It’s happened to many people and has ruined lives. Debtors working with Midland Credit have also had numerous problems with their debt validation letter being sent to the wrong address. But not just any address. Credit Management has often sent its responses for validation to the debtor’s parents’ residence. If you’re like most people, you don’t need the whole world knowing about your problems, especially your parents. It appears the thinking is that your parents will see the letter and offer to pay off your debt for you. It’s a sneaky move and has probably worked out on more than a few occasions for them. 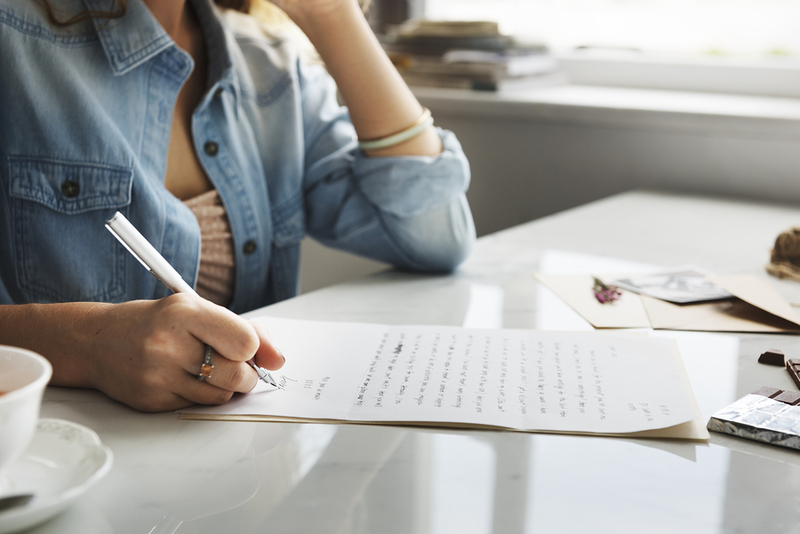 It is common for debt collection agencies to send letters that threaten action against you unless you make payment, and Midland Credit is no different. It’s what they do, after all. However, many people have received a collection letter asking for payment on an account that was actually opened by someone else, and when these individuals called, their problems only got worse. Many people have reported that the collection agent with whom they spoke was uncooperative and refused to help resolve any errors. The agent apparently thought that the people were just doing the ‘you’ve got the wrong guy!’ schtick. To their credit, they deal with people who falsely claim this all day long, but for the honest Joes and Janes out there, being treated this way is like being kicked when already down. You may have a judgment on your credit report that was put there by Midland Credit for an unpaid debt, but what do you do if the debt isn’t yours? Or, likewise, what if they’re trying to collect a debt you already paid? In some cases, the consumer never receives a statement from the original creditor because he or she, in many cases, already paid the debt through a website. If you didn’t receive a written notification from Midland Credit Mgmt Inc. before they filed the judgment papers with the court, you may be able to seek redress under the law. This is an example where having a credit repair law firm on your side is a great asset. After all, you still have rights, and when laws are broken against you they can set things right. We’ll have more on that coming up. Midland is aggressive when it comes to retrieving debts, and has been known to repeatedly call debtors for payment at improper times of the day. However, if they’ve tried to call you late at night or early in the morning, you have recourse under the law. Sometimes they continue to call even if the debt has been paid. Computers don’t sync up, and it’s not in the collection agent’s best interest to believe you because your name is on his computer. His job is to get money from people whose name appear on his screen. Oftentimes people are afraid of a lawsuit or damage to their credit score and will just pay again to make the calls stop. Don’t be one of these people. Know your rights. What are my legal rights during debt collection? They may not collect more money than you owe. They may not call you repeatedly all day long, early in the morning, or late at night. They may not speak intimidatingly or abusively. They may not inform other people of your debt if you are over 18 (with the exception of your spouse if you’re married). They may not ignore your debt validation request. Recognize any laws that have been broken? Midland Funding a subsidiary of Encore Capital Group, Inc.
To get an idea of how you can get collections like the ones from Midland Credit Management permanently removed from your credit history, check out this story from one of our readers. Below is a scanned image of the actual letter he received from TransUnion after working with Lexington Law. Not only did he get collections account deleted from Midland Credit Management, he also got two more removed: one from CBCS and one from Allied Interstate. Just imagine what that did for his credit, not to mention any of his future credit applications. Listen to his story to see how he achieved these results and how you can do the same. It started off when our reader hit some rough economic times in his life. He became unemployed after his employer tanked, and you guessed it — he couldn’t keep up with his bills without the steady income. He started charging basic living expenses, and when he wasn’t able to make any payments, his credit cards were sent to collections. Life then became an endless stream of phone calls from debt collectors. Not knowing what else to do, he decided to file for bankruptcy. 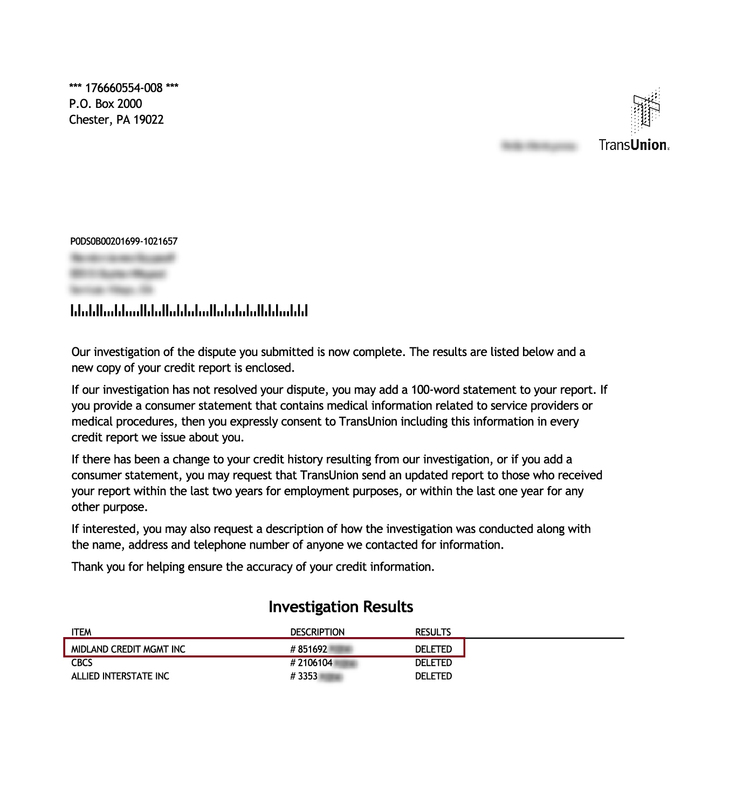 This helped with the debt collectors calling non-stop, but his credit score was completely shot. Not only that, he had the bankruptcy and all of his collections and late payments stuck on his report for the foreseeable future. For years after his bankruptcy, our reader was denied home loans and auto loans because of poor credit. After receiving multiple rejections, he finally confided in a friend, who told him about Lexington Law. The friend didn’t just mention it in a casual aside, he ranted and raved about how awesome they were. This was a close friend whose life story was very similar to our reader’s, so he decided to set his skepticism aside. Thankfully his friend insisted and showed him actual physical documents that proved what he was saying. After reading through them, he knew right then that he had to give them a try. Our reader went home and got online. He called (800)220-0084 and spoke to a credit professional who was friendly, understanding and beyond knowledgeable. He signed up, and after approximately three weeks, he began to receive letters from credit bureaus stating that negative accounts had been removed from his credit reports! Even better is that he stopped receiving aggressive phone calls from debt collectors. Not only did he have a brighter financial future, but daily life becomes so much more enjoyable and stress-free. Are you ready to do the same for yourself? “I have been a client for some time now and all I want to say is that your firm has been wonderful to me. I have told so many people about the work you have done. For over 28 years, Lexington has been the trusted provider of affordable credit repair solutions. Lexington Law has provided professional services and experienced support to hundreds of thousands of people. You owe it to yourself to at least check it out! Here’s a list of some of the nation’s most popular debt collectors that cause damage to your credit.